Where do colors come from? What makes someone a hero? What would a world without words be like? As creator and co-host of the popular public radio show Radiolab, Jad Abumrad has explored these questions and more. He brings his insatiable curiosity to Kenyon College on Saturday, Jan. 26. "If you haven’t listened to an episode of Jad Abumrad’s Radiolab, you are missing out on some of the best intellectual entertainment in the world. If you have listened, you know what I am talking about,” said Will Melick, the Bruce L. Gensemer Professor of Economics, who serves as chair of the Faculty Lectureships Committee that is sponsoring Abumrad’s visit. 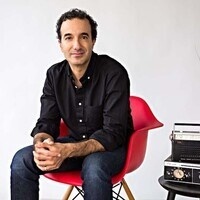 “Whether the show is centered on Typhoid Mary, forest floor fungi, CRISPR or the waning popular interest in space exploration, Abumrad is able to always connect the particular to the general to draw out larger lessons, using sound as his aide and companion. We cannot wait for his visit." Radiolab, created in 2002, is broadcast on more than 500 stations nationwide and is downloaded more than 9 million times each month as a podcast. It was awarded George Foster Peabody Awards in 2010 and 2015. More Perfect, which debuted in 2016, began airing its third season Sept. 18. To mark the occasion, the More Perfect production team partnered with musicians to release “27: The Most Perfect Album,” a collection of songs inspired by the 27 amendments to the U.S. Constitution. In addition to his work with Radiolab and More Perfect, Abumrad works as a composer and remixer. He earned a bachelor’s degree from Oberlin College, where he studied creative writing and music composition. In 2011, Abumrad was awarded a MacArthur Foundation “genius” grant. This event is free and open to the public. After Abumrad’s address, the audience is invited to a reception in Storer Hall’s Stroud Lobby. For more information, call 740-427-5108.